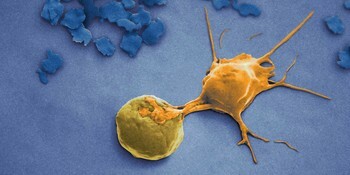 T Cell TransAct™ is a polymeric nanomatrix pre-loaded with CD3 and CD28 agonists and comes as a ready-to-use reagent. Due to its nano-sized matrix the stimulation reagent is applied volumetrically and does not require a bead-to-cell ratio calculation. It is the newest addition to our innovative portfolio of stimulation reagents. T Cell TransAct is available in both research and MACS GMP grades, making a seamless transfer of your T cell process into a clinical setting possible. MACSiBeads™ Particles are large cell-sized particles that can be loaded with any kind of biotinylated antibodies to activate and expand a variety of primary cells. 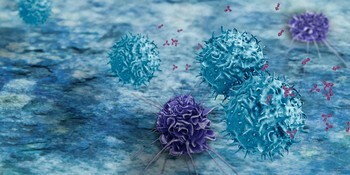 The large cell-sized particles mimic antigen-presenting cells and when loaded with CD2, CD3 and CD28, induce efficient T cell activation (e.g., T Cell Activation/Expansion Kit). This group of reagent needs to be applied in a specific bead-to-cell ratio. Our CytoStim™ Reagent is suitable for rapid stimulation of CD4+ and CD8+ T cells in fresh peripheral blood mononuclear cells (PBMCs), whole blood, or other leukocyte-containing single-cell suspensions from tissues. It can be used as a non-toxic SEB alternative, a positive control in antigen-specific T cell stimulation assays or intracellular cytokine staining experiments to detect cytokine or activation marker expression.